<br>Robert Luff & Co are delighted to offer to market this well presented detached versatile bungalow ideally situated in this favoured High Salvington location nestled next to the South Downs enjoying stunning sea views. The property also benefits from being close to the comprehensive local shopping facilities, schools, bus routes and easy access to both the A27 and A24 nearby. Accommodation offers entrance hall, living room with feature bi-folding doors out onto the decking, re-fitted kitchen with Corian work surfaces and integrated appliances opening through into a multi functional lounge / dining conservatory, two ground floor double bedrooms, modern family bathroom and office / bedroom four. Upstairs is a master bedroom suite enjoying southerly views out to sea with en-suite bathroom and fitted wardrobes. Other benefits include ample off road parking on a block paved driveway, garage with up and over door and a stunning over sized west facing rear garden in excess of 130ft offering scope to develop subject to planning. Double glazed window to side aspect enjoying rooftop views out to sea, continuation of the stunning parquet flooring, radiator, TV point, feature fire place with marble effect surround, feature bi-folding doors opening out onto the decking extending this living space out into the garden. Brick built with double glazed windows to rear and side overlooking the garden, self cleaning glass feature vaulted roof, tiled effect flooring, two wall mounted heaters, space for dining table and chairs, space for sofa, double glazed door to rear providing access, double glazed double doors open out onto the decking, enjoys stunning sea views. Double glazed bay window to front, radiator, TV point, built in double wardrobe with hanging space and shelving, coved and textured ceiling. Double glazed window to front, radiator, wall mounted TV point, space for wardrobes, coved and skimmed ceiling. Double glazed window to side aspect enjoying views out to sea, feature parquet flooring TV point, telephone point, radiator, coved and textured ceiling. Two double glazed frosted windows to side aspect, tiled floor, panel enclosed bath with central chrome mixer taps, mains shower and screen, low level flush w/c with built in vanity unit offering shelving and housing the boiler, wash hand basin with chrome mixer tap, part tiled walls, chrome heated towel rail, skimmed ceiling with spotlights. 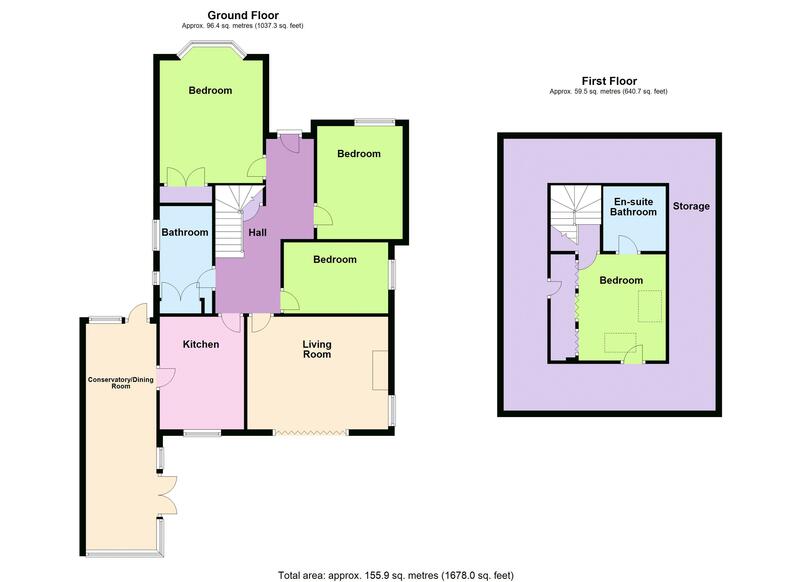 Double glazed velux window to side enjoying sea views, tiled effect flooring, panel enclosed bath with mixer tap and shower attachment, low level flush w/c, wash hand basin with mixer tap and vanity unit below, radiator, part tiled walls. A beautiful feature of the home is this wonderful landscaped rear garden, west facing and private the garden enjoys stunning views out to sea from the raised decking that wraps around the back of the bungalow with feature LED lights, the garden is mainly laid to lawn with a central pond, newly laid patio, summer house, potting shed, attractive flower and shrub borders, a path leads to the back of the garden, measuring some 120ft plus. Other benefits include a side gated entrance and rear access into the garage. Attractively landscaped with flower and shrub boarding. Block paved providing off road parking for several vehicles and leads to garage. Up and over electric door, power and light, double glazed door opens out into the rear garden.